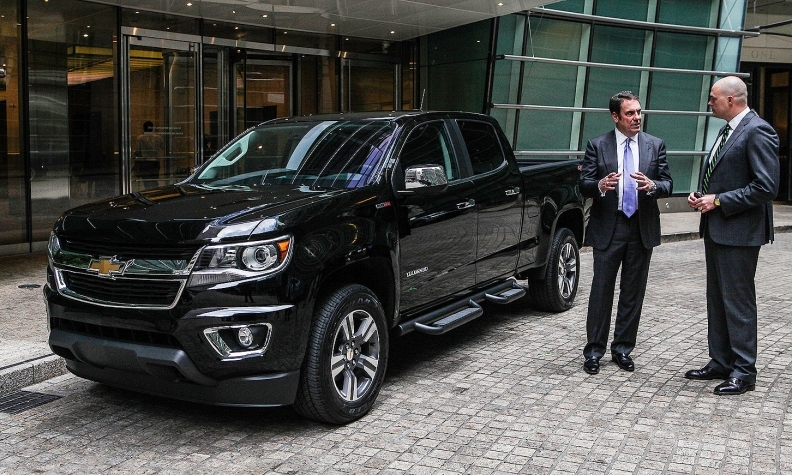 Mark Reuss, left, head of global product development for GM, with the diesel-powered Chevrolet Colorado in New York last month for a media interview. Chevy's midsize pickup has changed markedly since the previous generation, which ceased production in 2012. So has its buyer profile. DETROIT -- Two years ago, General Motors' Mark Reuss relaxed on a lounge seat at the Los Angeles Auto Show, a few yards away from the new Chevrolet Colorado pickup that he'd unveiled hours earlier. Reuss chuckled when asked about GM's gamble on smaller pickups, a category Ford and Ram had left for dead. Could he recall a time when one of the Detroit 3's pickup strategies had diverged so sharply from rivals'? "No. It's wild," Reuss said, beaming. "This is going to be exciting to watch." Now, one year after the Colorado and sibling GMC Canyon hit U.S. showrooms, Reuss has 95,000 more reasons to smile. That's how many of the pickups GM was estimated to have sold this year through October, surpassing experts' full-year sales estimates in just 10 months. (IHS Automotive had pegged 81,000 for all of 2015.) They're getting snapped up nearly as fast as they arrive, with virtually no incentives. And customers tilt younger, more highly educated and more urban than Chevy's other pickup buyers. So far, Reuss and other GM execs are entitled to a collective "told ya so" on one of the industry's most closely watched gambits in recent years. Skeptics wondered why GM thought consumers would want a smaller pickup. After all, customers had been voting with their wallets for more than a decade (the market for smaller pickups has shrunk by nearly 80 percent since 2000). 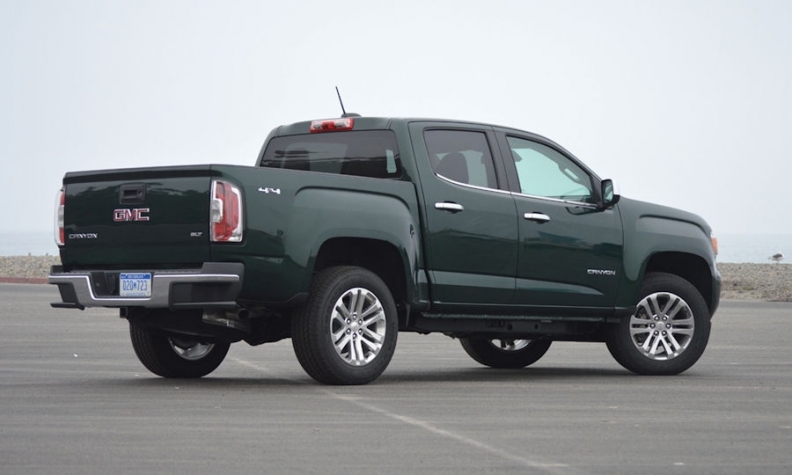 The success of the Colorado and Canyon suggests buyers simply weren't being given enough compelling reasons before to consider a smaller pickup. Chevy reconfigured the Colorado as a feature-packed lifestyle vehicle for surfers and cyclists, with wireless connectivity and an Apple CarPlay infotainment interface. The Canyon was given the same goodies but with a brawnier look to appeal to more traditional pickup buyers. "The idea of offering more choice resonates pretty deeply with truck buyers -- more sizes and trim packages and options and accessories," says Mark Williams, editor of enthusiast website PickupTrucks.com. "GM seems to have the right truck with the right message." And it's not just pickup buyers. More than one-third of Chevy Colorado and GMC Canyon customers have traded in a car, crossover or SUV, GM says. That seems to validate the company's strategy of luring nonpickup buyers with features and creature comforts that hadn't been offered in smaller pickups. The Canyon's average transaction price of about $34,100 is tops in the midsize-pickup segment, data from Edmunds.com show. The Colorado's is $31,800, higher than the segment-leading Toyota Tacoma's $30,015, though that should rise after the Tacoma's recent redesign. The percentage of buyers from other brands -- the conquest rate -- is 56 percent for Canyon and nearly 50 percent for the Colorado, GM says. The Colorado's top conquests are Tacoma and Ford F-150 buyers. Around 40 percent of Colorados are rolling off dealership lots accessorized with bike racks and other gear, boosting dealer and GM profits, the company says. Perhaps the most important measure of success doesn't show up in the Colorado's numbers at all: Sales of the big brother Silverado are red hot, too, erasing concerns that the Colorado would simply siphon sales away from GM's biggest money maker. Through September, U.S. sales of the Silverado jumped 15 percent, making the Silverado the only one of the top five full-size pickups to post double-digit sales growth (followed by the GMC Sierra, up 9.8 percent; Ram, up 3.4 percent; Ford F series, up 1.3 percent; and Toyota Tundra, up 0.9 percent). Just 12 percent of Chevy Colorado buyers traded in a Silverado in the 90-day period from May through July, IHS Automotive data show. The rate of Sierra-to-Canyon converts was even smaller, at 9 percent. "Everyone thought that the Colorado might eat into Silverado sales," IHS analyst Tom Libby says. "That hasn't happened." 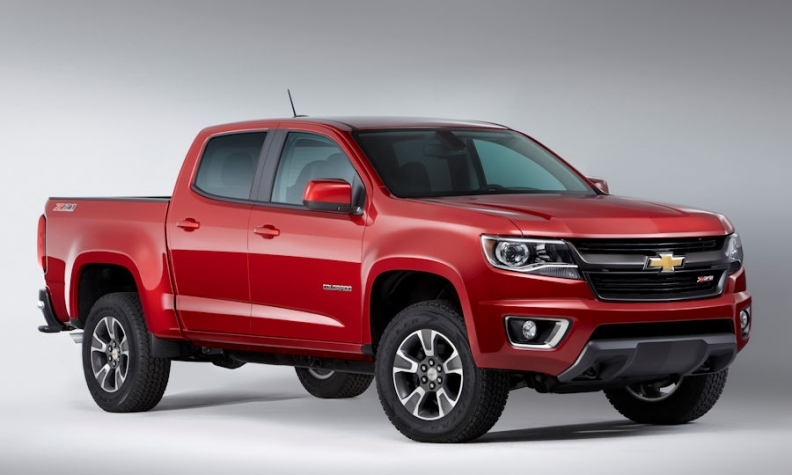 The top market for the Chevy Colorado is California. Its success there "all of a sudden starts to create some momentum around the brand" in a market where Chevy long has struggled for a foothold, Chevy global brand chief Alan Batey said in an interview last month. In the Los Angeles metro market, Chevy's overall sales were up 16 percent through August vs. 10 percent for that market as a whole. Chevy's marketing play for the Colorado took the brand out of its usual comfort zone -- think big sporting events and Texas -- to target active, outdoorsy buyers who might identify more with Subaru than Silverado. Over Labor Day weekend, Chevy sponsored the U.S. Sand Sculpting challenge in San Diego, for example. Competitors are responding. Toyota is taking dead aim at the Colorado's active-lifestyle psychographic with a new advertising campaign that features young people tearing through the desert under the banner "Play Now." And old Detroit 3 rivals are threatening to jump back into the midsize pickup market, which could water down profits in a segment that's still only one-sixth the size of the full-size pickup market. Ford is considering a revival of its Ranger for the U.S., while Jeep plans a Wrangler-based pickup. Those trucks would be at least a few years off, though, leaving GM execs feeling pretty good about their decision. "The pundits and manufacturers questioned the soundness of our plan," says Sandor Piszar, Chevy's director of truck marketing. "Now, we see folks scrambling to catch up."